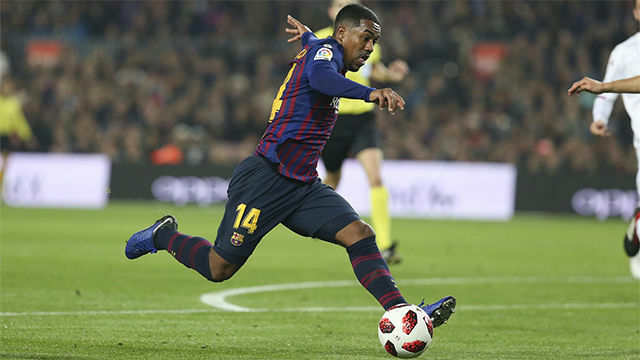 Malcom will miss 15 days with an ankle sprain sustained in the 4-1 win over Cultural Leonesa. The Brazilian, who got injured and left the pitch crying, "suffered a sprain in his right ankle that will keep him out for between 10 and 15 days" according to the club's medical statement on Thursday afternoon. Malcom misses three games. The Catalan derby against Espanyol, the Champions League match against Tottenham and the La Liga clash with Levante. He may return to face Celta Vigo on December 22 if his recovery is quick and easy. "It was a stroke of misfortune that led the player to slip nastily. He left the field in tears and to a standing ovation from the over 76,000 fans in the stadium," said Barca. "With all three substitutions made, Barça saw out the remaining moments with just ten men, although by then the place in the last sixteen of the Copa del Rey was more than secure." Malcom has had some bad luck with injury. On Sep. 3 he suffered another ankle problem that kept him out three weeks. He has played in nine games from the 21 total played by the first team. He has scored two goals, including yesterday's against Cultural.